This is a quick and dirty one. Maybe it'll lead somewhere, maybe not. You can blame Matt Jezyk for this. A comment he posted on Zach Kron's Pantheon dome (long back) caught my attention about 18 months ago (when most of this work was done). This is the building Matt was referring to: Saint Charles of the 4 fountains (my translation) Just take it as a starting point for an exploration. Next came a drafting view to figure out the basic tesselation and derive a spacing for the grid. There are some root 2 values in there because of the octagon, so I used 4 decimal places. It's nice to know that the reference lines in the curtain panel template follow each other around, so you can select 4 points and type in their position (fraction of 1). Then select the next 4 and ditto. Speeds things up a bit, but this stuff takes a while. Join them up in pairs to make a grid, turn these into reference lines so they don't show up in the host project. 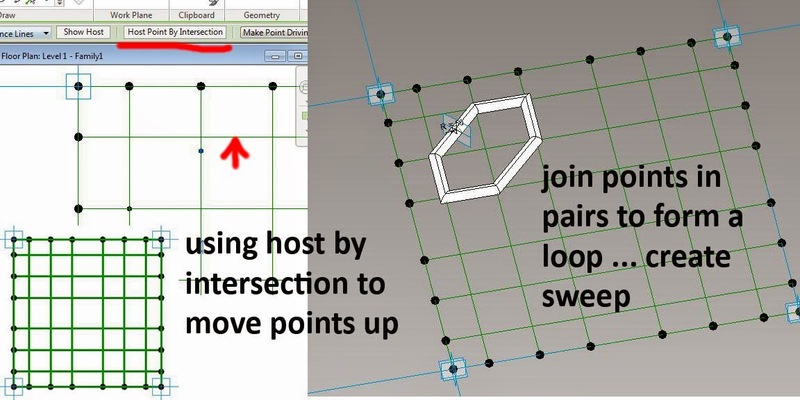 Then there are lots more points to host on a line and move up to the crossing point using host by intersection. More spline by point to join up pairs & eventually we get some loops that we can use to make geometry. I opted for tube sweeps because that's the easiest and I wanted to test something out before investing more hours in developing a detailed solution. Load the curtain panel component and populate the serface. The result is quite interesting. It cuts the corners, which is not good, but otherwise it is quite promising. One of these days I will make an adaptive component with 9 points and use this to simulate a panel that wraps itself around the curve. That's for the future. Back to the past. I wanted to put the dome into context, based on bits and pieces of reference material I've picked up over the years. The geometry is typical Borromini. Triangles, Circles, Elipses. I mapped this out and placed the main columns. But how high to make them? I didn't have a section, so I did a bit of drafting over an internal photo. It's a starting point at least. Add a ring beam over the columns, an apse at one end and an arch at the other. Then an ellipsoid ring beam to support my "divided surface dome" Looking at it now the columns appear too short. At this stage I usually take a couple of camera shots to compare my model to actual site photos. Try to pick up mistakes in proportion early on. That's as far as I was able to go at the time. It's been sitting there waiting for long enough so I decided to share. Makes an interesting complement to the St Ivo studies. I do hope I can find another weekend some time to take this to the next level. It's a building that made a big impact on me as a teenager when I first started to take an interest in architectural history. I haven't even started on the faced yet, which is the element that first caught my attention. Virtuoso interplay of concave and convex forms. But even this brief study has given me a much better understanding of this fascinating building. Francesco Borromini, volatile, brooding, controversial ... one of my early heroes. I've had a couple of goes at studying his work with Revit. Not easy. This one is St Ivo Sapienza. Most of the work was done in August last year. The well known feature is the dome, from inside. The geometry is based on circles & triangles. It's a chapel, built within an existing setting: the university of Rome, three stories around a courtyard. Situated between the Pantheon & the Piazza Navonna. 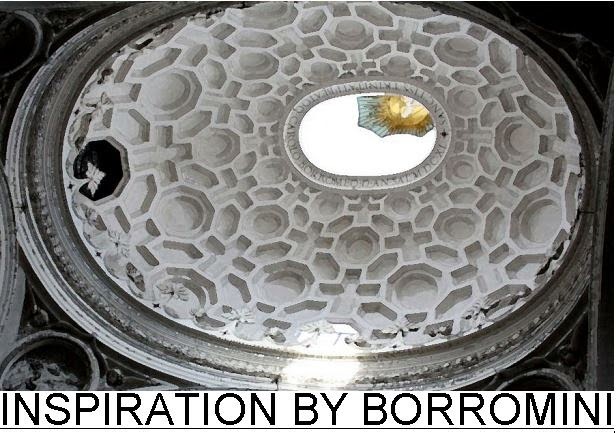 As usual with Borromini, one of the major themes is a play between concave & convex. solid and void, undulating forms that deceive the eye. I built the dome as an adaptive family: two solids and one void. From the outside you see an upper dome (loft) sitting on a drum (extrusion), both with 6 lobes. The third element is a lofted void, cutting through both solids to form the complexity of the internal dome. The profile for the upper dome uses arcs with their centre marks switched on. These slide up and down reference planes in response to a scaling parameter. Three instances of the profile make a lofted solid. The drum profile is points based: bold curves alternating with short flat sections. Just a simple extrusion this time. The complex void that cuts away the inner dome was more difficult to set up. Points based again, and using the circles-in-triangles idea. There is a large equilateral triangle, set up with reference planes. This constrains most of the points and defines the straight-line segments. The mid-points of the curves slide up and down on radial ref planes. There are 4 dimension parameters which are converted down to one overall dimension and two bulge factors by some simple formulae. The result is a parametric form that is relatively easy to fine tune to get a close fit between the 3 elements and to adjust the thickness of the dome wall. It's also fully scalable so it could be resized in response to new information as my research proceeded. In the parent family all the linked parameters are expressed as multiples of a basic module "M". Vary the module and the whole thing will scale proportionally. Adjust the numbers in the various formulae and you can alter the proportional relationships. Usually, in this kind exercise, I find that it takes a while to get to grips with the source material. Very often the model is well advanced by the time I figure out a set of grids and levels that gives a reasonable match to the data. That was the fancy, parametric part of the exercise. From there I proceeded to develop the whole building. As work proceeded I realised that this is a variation on the "squared circle" theme that has been used by many famous architects. The Altes Museum by Schinkel & Stockholm Library by Asplund spring to mind immediately. See how the repetitive rhythm of the cloisters draws the eye towards the complex form of the chapel, make this the focus of the whole composition. It also interests me that the exterior facade is relatively bland and business-like. No need for outer show, except perhaps for the lantern over the dome. The only element which can be seen from afar. A perspective view looking down the court towards the chapel shows the rhythmic effect and the contrast between regular forms and voluptuous curves. Important to note that I have not modelled everything in full detail. As always this is a simplified abstraction, designed to capture the spirit of the original. LOD 100 perhaps. I may come back and take it to the next level some day, but for now this is enought to give me a much deeper understanding of how the building works: its form, its construction, its functional relationships. That's the power of BIM as a research tool. The combination of 3d with orthographic, the parametrics, the documentation tools. Whether you are doing historical research like this, or working on a live fee-earning project, BIM excels at forcing questions upon you as you work. It's a great way of working, and I could not have achieved these results working in CAD. I know because that's what I was trying to do about 15 years ago, but I had neither the time nor the patience to reach this kind of level of analysis using CAD tools. I am constantly amazed by the last few diehards in our office who continue to use a disconnected workflow. I know you can do wonders with xrefs & layers and the output these guys achieve is quite impressive. But there's no way I would want to go back there and I have never met anyone who enjoys returning to CAD once they have achieved fluency in Revit. But let's not fool ourselves. A building such as this, with it's highly sculptural solid walls, is quite challenging to model. It's tempting to model the walls in place, but then you lose some of the intelligence of the system wall tool. Of course it's easy enough to "fake" a floor plan with 2d drafting and make it look convincing. I can't help wondering how Borromini himself worked. Obviously he drew by hand, but to what extent did he use physical models ? How much did he actually figure out on site, directing the craftsmen with words & gestures ? We know that Gaudi achieved the wonderful plasticity of his work by these kinds of methods. So let's not get too puffed up about BIM. It's a wonderful idea, but clarity of vision trumps software any day of the week.